Here's a beautiful oil tanned leather belt that "The Master" wears. It has the Nike G-Flex stretch insert which seems to be standard in all of Tiger's belts. The buckle is a brushed finish with the embossed Tiger Woods logo on the top side of the buckle, and of course it has the coordinating finish on the loop ornament. This is a good looking belt that I would certainly wear. 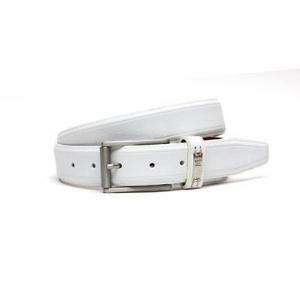 It's a little flashier then my other favorite, the Nike Golf Tiger Woods Men's Croco Leather Belt. The Croco leather is brown and goes better with my crocodile shoes. Of course, now that I think of it, this G-Flex belt matches my two-tone suede dancing shoes. Whichever one you go with, you're going to be noticed. After all, you are wearing the same belt as the greatest golfer of all times.